Section 7: Tournament Finals arc (第（だい）匕章（しょう） 決（けっ）勝（しょう）トーナメント編（へん） Dainanahō Kesshō Tōnamento-hen) is a story arc in the Yu-Gi-Oh! manga. The Duels between the eight Battle City finalists, Marik Ishtar, Rishid, Seto Kaiba, Katsuya Jonouchi, Yugi Mutou, Mai Kujaku, Ryo Bakura and Ishizu Ishtar take place. This arc contains the following chapters. The "subseries number" column contains the numbers the chapters used in their first English printing in Yu-Gi-Oh! Duelist. The first round of Battle City's quarter-finals start. The first Duel is between Yugi Mutou and Ryo Bakura who is being controlled by the evil spirit of the Millennium Ring, Dark Bakura. Dark Yugi and Dark Bakura continue their Duel in the first round of the Battle City finals. Just after Dark Yugi destroys Dark Necrofear" he learns its true power, also allowing Dark Bakura to play "Destiny Board". Dark Yugi and Dark Bakura continue their Duel in the first round of the Battle City finals. With a special Spell Card, Bakura turns the Duel to his side, with one draw and one turn left before the Destiny Board finishes spelling its message. "Are You Going to Attack?!" With all the odds against him, Dark Yugi has Summoned "Slifer the Sky Dragon," his God card. Dark Bakura appears to have lost, but Marik Ishtar has a last dirty trick up his sleeve. "For the Sake of Bonds!!" Dark Yugi defeats Dark Bakura with "Slifer the Sky Dragon," leaving Bakura badly injured. Jonouchi vows revenge on Marik Ishtar, as the second match of the quarter finals is announced. The second round of the Battle City quarter-finals begins, with Jonouchi vowing to defeat Marik Ishtar, who is still being impersonated by Rishid. But Rishid's Trap Deck proves to be a deadly challenge. The second round of the Battle City quarter-finals continues, with Jonouchi facing Rishid, who is still posing as Marik Ishtar. Rishid's Trap Cards force Jonouchi onto the defensive, and his assault begins to overwhelm Jonouchi. Jonouchi faces Rishid, who is posing as Marik Ishtar, in the second quarterfinal match of Battle City. Rishid's Trap Monsters overwhelm Jonouchi, causing him to lose his confidence. Jonouchi gains the upper hand against Rishid (still impersonating Marik) in the second quarterfinal match of Battle City, when he Summons the Trap-destroying "Jinzo". Rishid, however, faces an even more dangerous challenge than Jonouchi's "Jinzo" when he draws the card that Marik put in his Deck. Rishid Summons the guardian of the "Royal Temple", the "Mystical Beast Selket." Jonouchi is driven back, but refuses to go down without a fight. His words cause Rishid to remember the days of his and Marik Ishtar's childhood. The "Mystical Beast Selket" continues to drive Jonouchi into a corner. Even though he is unable to fight back, Jonouchi has realized that Rishid is not actually Marik Ishtar. Marik forces Rishid to Summon the counterfeit "The Sun Dragon Ra". But the real "Ra" is angered by the act, and its actions put both Rishid and Jonouchi in severe danger. With Rishid falling comatose, Marik Ishtar's dark side emerges, while the outcome of the Duel is still to be decided. The third Duel of the Battle City's quarterfinals starts between Mai Kujaku and Dark Marik, who uses his Millennium Rod to turn the Duel into a Shadow Game. Dark Marik immediately turns the Duel between him and Mai into a Shadow Game, causing illusions that seem real and fearful. With guidance from Dark Yugi, Mai is able to fight back against Dark Marik, despite his Shadow Game, only for Dark Marik to continue to press his attack. Mai takes "The Sun Dragon Ra" from Dark Marik, but is unable to control it. Mai Summons "The Sun Dragon Ra", but the God remains silent, locked away in a golden sphere, and Dark Marik reveals that only the chosen can read the Hieratic Text inscribed upon the card that is needed to control it. Dark Marik takes control of "The Sun Dragon Ra" and prepares to use it to kill Mai. Unable to watch his friend die, Jonouchi intervenes. "The Beginning of the "Future!"" Having defeated Mai Kujaku, Dark Marik subjects her to a Penalty Game. Then the last Duel of the Battle City semi-finals between Seto Kaiba and the eight duelist, revealed to be Ishizu Ishtar, Marik's sister, starts. Kaiba and Ishizu Ishtar begin the last match of the quarter-finals. Kaiba plans to wipe out Ishizu's Deck like he did against Yugi, but Ishizu remains confident that her victory is assured. "The One Chosen by "God""
Kaiba and Ishizu continue the last match of the quarter-finals. Kaiba plans to wipe out Ishizu's Deck, but Ishizu not only predicts the strategy, but foresees that Kaiba will die by his God's own hand. Kaiba and Ishizu continue the last match of the quarter-finals. Kaiba wipes out most of Ishizu's Deck, only for Ishizu to completely turn the tables. Ishizu has turned Kaiba's Deck Destruction strategy against him, resulting in his Deck only containing six cards. Encouraged by Yugi, Kaiba fights on, believing his only hope to win is to Summon "The God of the Obelisk". As Ishizu predicted, Kaiba Summons "The God of the Obelisk". Even so, he is a mere step away from total defeat, when the Millennium Rod activates. Kaiba sacrifices "The God of the Obelisk" in favor of his "Blue-Eyes White Dragon", and he defeats Ishizu, changing the future she saw with the Millennium Tauk. Kaiba has defeated Ishizu, but his victory is marred when he finds he can understand the horrifying Hieratic Text written on "The Sun Dragon Ra". Meanwhile, Ishizu reveals to Yugi and his friends just why Marik hates them so. Ishizu continues her tale. After she and Marik encountered Shadi aboveground, who warned of the tragedy that would soon strike their clan, they returned home to find their father brutally torturing Rishid. With Rishid's fall, Dark Marik emerged for the first time. As night falls, Ishizu gives her Millennium Tauk to Yugi. Meanwhile, Dark Marik returns to kill Rishid, but is opposed by Dark Bakura and the original Marik, who had implanted part of himself in Bakura when they allied initially. Evenly matched in terms of power, they begin a Shadow Game. Dark Marik faces off against Dark Bakura in a Shadow Game where the loser will be killed. Dark Bakura is wary of "The Sun Dragon Ra", but Marik has a plan to combat it, vowing to right the wrongs he committed by killing both halves of himself. Dark Marik faces off against Dark Bakura in a Shadow Game where the loser will be devoured by the darkness as they lose Life Points. Dark Marik is put at a disadvantage as he tries to draw his God card, despite Dark Bakura losing most of his Life Points. "Birth of the Dark God!!" As Kaiba deciphers the second power of "The Sun Dragon Ra," Dark Marik demonstrates the "One-Turn Kill" in question against Dark Bakura. With Dark Bakura devoured by the darkness, Marik turns to Ishizu for help. Meanwhile, both Kaiba and Yugi reaffirm their desire to win. Dark Bakura, meanwhile, has lived on through the fragment of his soul that he sealed in the Millennium Puzzle. The airship arrives at Alcatraz, where the Duel Tower to hold the semi-finals and finals is located. Rather than the use of a lottery to decide the semi-final match-ups, the match-ups will be decided by a four-way Battle Royal Duel. The semi-final match-ups will be decided by a four-way battle royal. The first two Duelists to lose will face each other. Kaiba taunts Yugi and Jonouchi, as he hopes to face Yugi in the semi-finals to fufill their rivalry and gain an advantage against Dark Marik. Jonouchi, meanwhile, is torn between keeping his promise to Yugi and saving Mai. Kaiba continues to manipulate the Duel, attempting to force Dark Marik and Jonouchi to face each other. Jonouchi begins to make a comeback. The four-way Duel to determine the Battle City finals match-ups comes to a close. Jonouchi puts his plan into motion. The first Duel of the semi-finals begins, with Jonouchi facing Dark Marik in order to save Mai, while Kaiba plots to use Jonouchi to observe "The Sun Dragon Ra". Dark Marik has turned his Duel with Jonouchi into the same Shadow Game as he did during his Duel with Mai. Vowing to rescue Mai, Jonouchi goes ahead with the Shadow Duel. "Falling into the Deadly Darkness!?" Dark Marik's Trap Cards and combos begin to slowly put pressure on Jonouchi, but he manages to make a comeback. Jonouchi fights back against Dark Marik's Trap Cards with "Jinzo", but Dark Marik still has a few tricks up his sleeve. "Bolt Out of the Blue!!" Dark Marik's new combos put Jonouchi at risk of not just loss of points, but tremendous strain from the life-lines to his monsters as well. Kami Dai San no Nōryoku!! Jonouchi Summons "Gilford the Lightning", forcing Dark Marik to re-evaluate his opponent and judge him worthy of facing God. Dark Marik reveals the third power of "The Sun Dragon Ra"; "God Phoenix", planning to use it to devastate Jonouchi. "A Light to the Future!!" Sora o Saku Toki no Koe!! "A Battle Cry to Split the Skies"
Dark Yugi and Seto Kaiba line up for their Battle City Duel. The semifinal between Dark Yugi and Kaiba begins. Kaiba takes an early lead, attempting to quickly Summon "The God of the Obelisk". Yugi saved himself from Kaiba's "The God of the Obelisk" during their Battle City semifinal Duel. "Secret Plan to Call God!!" Dark Yugi and Kaiba continue their Duel. Kami wo Koeta Shimo Be!! "The Demon of Victory or Defeat!!" Dark Yugi and Dark Marik start their Battle City final Duel. 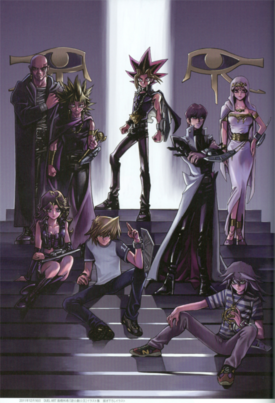 Dark Marik commences a Shadow Game, where the each Duelist's other personality's life is at stake. Dark Yugi and Dark Marik start their Battle City final Duel. Dark Marik plots to summon "The Sun Dragon Ra" from the Graveyard by getting "Monster Reborn". Dark Yugi initiates his own plan of summoning a God Card before Dark Marik. Dark Yugi and Dark Marik continue their Duel. Dark Yugi summons Slifer the Sky Dragon, but Dark Marik uses face-down card, capable of Summoning "The Sun Dragon Ra" from the Graveyard. Dark Yugi and Dark Marik continue their Duel. After burning "Slifer the Sky Dragon into ashes, "The Sun Dragon Ra returns to the Graveyard. Dark Yugi prepares to draw what could be his last card, hoping that it is the card granted to him by Kaiba. Without even looking at it, he Sets the card, placing his hopes in it. In response, Dark Marik re-Summons "The Sun Dragon Ra", and unveils its second power. Even as Dark Marik merges with "The Sun Dragon Ra", Dark Yugi continues to fight, activating the card he Set without even seeing - "Devil's Sanctuary". Dark Yugi and Dark Marik continue their Duel. Dark Yugi has Summoned "The God of the Obelisk" and attacks Dark Marik with it, causing him to lose most of his Life Points. Dark Marik has fused "Revival Jam" with "Metal Reflect Slime" to form "Immortal God Slime", who has become an immortal wall to block all of Yugi's attacks. Kami no Ken, Kami no Tate!! Dark Marik has retrieved "Monster Reborn" to Summon The Sun Dragon Ra from the Graveyard. Facing "God Phoenix", Dark Yugi responds by resurrecting "Slifer the Sky Dragon" from the Graveyard to defend "The God of the Obelisk". "Surprise Attack from The Darkness"
After "God Phoenix" returns to the Graveyard, Dark Marik continues his assault by using the Spell Card, "Surprise Attack from the Darkness". Dark Yugi responds by powering up "The God of the Obelisk" to engage against Ra's second attack. With Marik's determination while on the verge of death, Yugi goes on and obliterates Marik's shadow using the combined powers of "Dark Magician" and "Dark Magician Girl". Namanaru Yami ni Hikari wo!! "The Living Darkness is Shown the Light"
Dark Yugi and Dark Marik conclude their Duel in the last round of the Battle City tournament. Dark Yugi defeats the "The Sun Dragon Ra". Marik, with his last Life Point, decides the outcome of the Duel.